VESPA RED launched in India | IAMABIKER - Everything Motorcycle! Like we reported earlier, Piaggio Group today launched the (VESPA)RED in India as part of its partnership with (RED)® and commitment to the fight against AIDS. 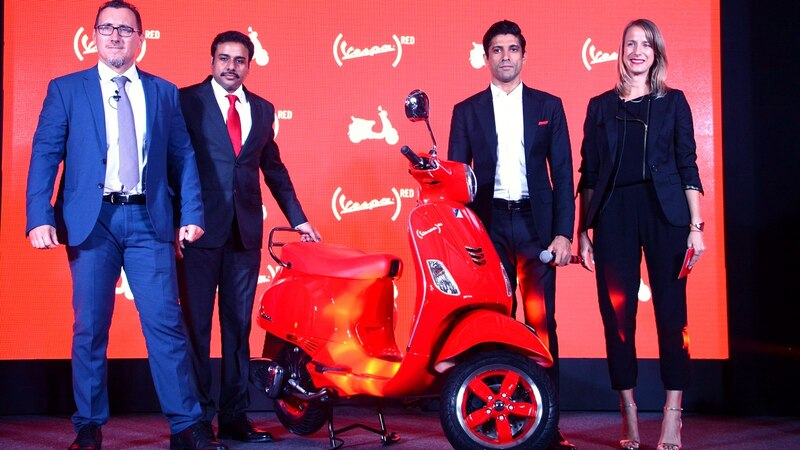 Bollywood celebrity, Farhan Akhtar, presented and owned the first (VESPA)RED in Mumbai today. Vespa and (RED)® are two prestigious and highly respected worldwide brands, and they have joined forces as they share the same values and a common vision that wants to leave a better world for future generations. Vespa, a model born to celebrate the beauty of a mode of transport that has achieved legendary status, is the first brand from the automotive world to collaborate with (RED)®. Throughout its history, Vespa has been surpassing the bike’s core function as a simple and elegant vehicle and turning it into an extraordinary testament to its time, interpreting societal change and evolving accordingly. As such, funding an international project of such high social sensitivity is wholly consistent with Vespa’s values and DNA – after all, The Piaggio Group through its charity program “Vespa for Children” has historically been sensitive to the problems connected with protecting the health of children. This (VESPA)RED is a highly exclusive model, created specifically for the Indian market alone. Not only does it contribute to a social cause, it is also a fascinating product, the cutting edge of the Vespa experience in terms of style and image. When a (VESPA)RED is purchased, it will trigger a $50 USD donation to the Global Fund to fight AIDS in India. Each scooter sold can help provide more than 165 days of lifesaving HIV medication – medication which can help save a mother’s life and prevent her from passing the virus to her unborn baby. Vespa is proud that it’s renowned bike and beloved product is turning (RED)® — elevating its elegant style and design to new heights – now has the power to fight AIDS in India. (VESPA)RED is offered in a high definition red body colour, complementing 12” red alloy wheels, red art leather seats and powered by a 125 CC engine. The bike has features like 220 mm front disc brake, Monocoque single piece steel body, aircraft inspired single sided front suspension, and many more. The (VESPA)RED is also offered with colour coordinated exclusive (VESPA)RED merchandise including a helmet, T-shirt and hat. It will be priced at Rs. 87,009/- ex showroom Mumbai and will be available for sale at Vespa dealerships across the country.